Solana Beach always holds a warm place in my heart as it was my first ever triathlon and Mike has raced it every year since we met which means I’ve either raced or spectated the event for 5 years straight. Solana Beach is the beach town just south of mine (Encinitas) and Fletcher Cove, where the race is held, is the turn-around point for one of my most frequented medium distance runs (8.4 miles roundtrip). To top it off, The ACTIVE Network, Mike’s employer of 8+ years, has been the primary sponsor of the race for the last few years. This race is about as close to home as it gets. ACTIVExers Getting Ready to go! My main goal for this race was to have fun and enjoy the day. I wanted to race hard and enjoy it. It’s an incredibly short race – 1/4 mile swim, 9 mile bike and 3 mile run (although T1 should be added in the distance as its quite a long jog which includes a very steep hill) – and is always a thigh and lung burner. If you aren’t in pain for the majority of the plus or minus 1 hour that you are racing, you’re doing it wrong. 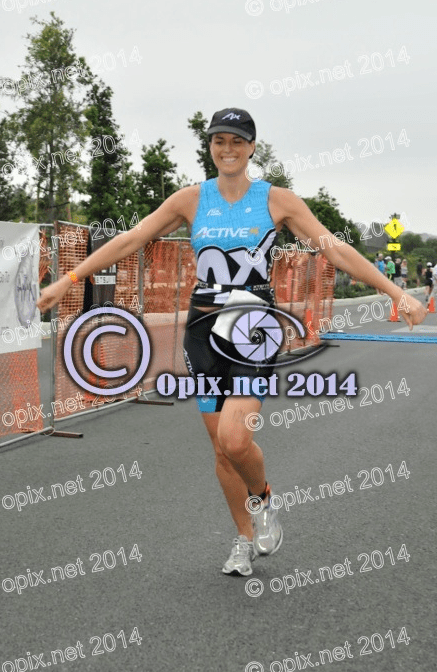 This was my first time racing Solana Beach in my new age group, 30-34. Instead of starting right before Mike’s wave with all the women under 30 (which includes all the Tri Juniors all the way down to age 13/14 even), I started right after Mike at 7:30 AM. My wave was much smaller since it only included 1 age group instead of 3. The waves take off 10 minutes apart and since the swim is so short, I was actually able to watch Brooke and the other under 30 age groupers get out of the water before I rushed back to watch Mike start his wave. After he started, I did a quick warm-up and still had time to watch him exit the water before my wave started 10 minutes later! It was a pretty exciting 20 minutes. Before I knew it, it was time for me to go and there was no time for nerves. As soon as they said “go” I made the conscious decision that I was going to swim hard. Thanks to all the open water swim entry practice I’ve been getting lately with the Wednesday night ACTIVEx swims, I quickly found myself very close to the head of the pack after sprinting into the water and dolphin diving my way through the waves. 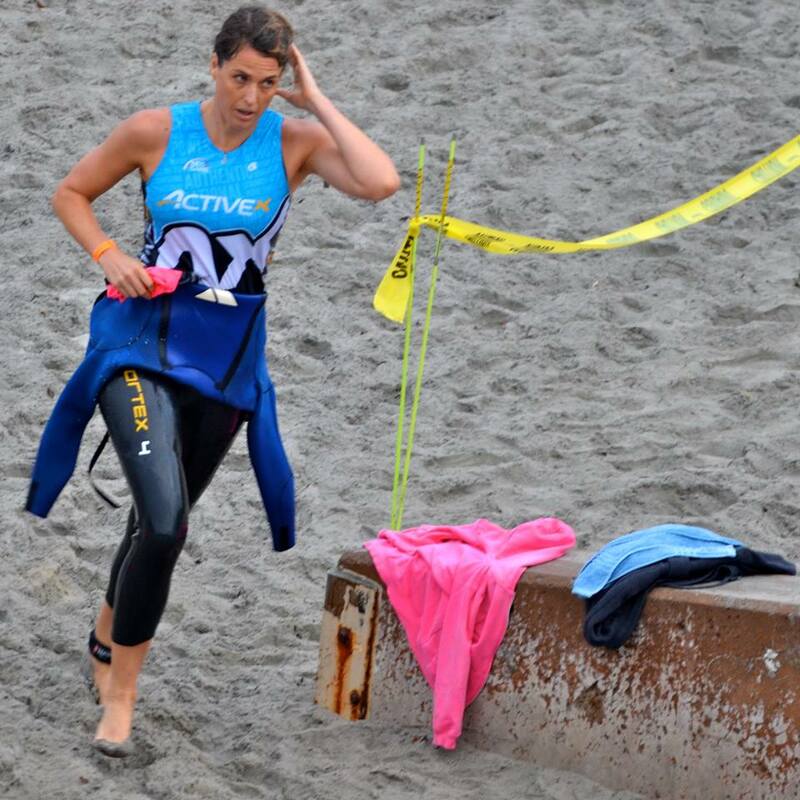 As I started to swim I was surprised that I continued to stay with the front of the pack, and for the majority of the swim I was in third place. It was pretty exciting and gave me the drive to swim as hard as I could. As I turned the final buoy to head in, I started to feel a bit tired and a little disoriented as to where the beach was so I did a few breast strokes and then kept going. I think I stood up a little too early because I felt like it took me a long time to get to the beach. 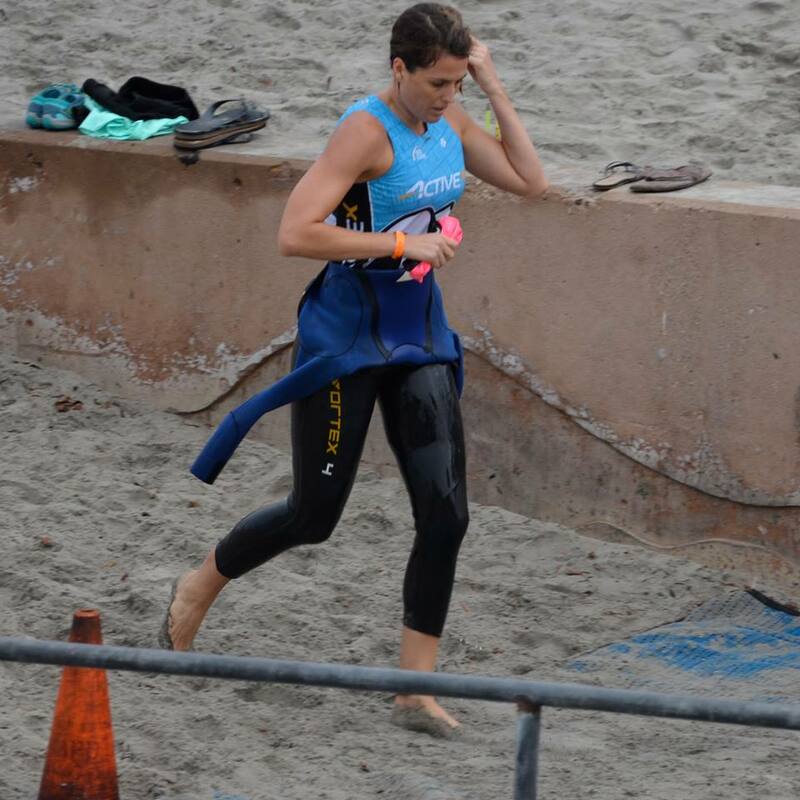 Once I crossed the swim finish line and was officially into T1, I immediately took off my cap and googles, started taking my wetsuit and focused on making my way up the steep hill. My co-worker Marc was on the hill cheering me on and yelled at me “You’re in 4th, go get them!! 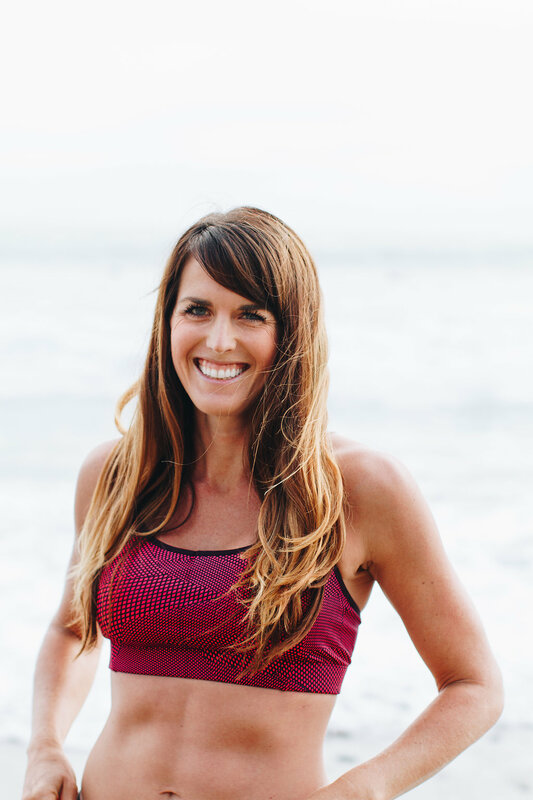 !” I passed one girl in my age group going up the hill – but damn, that hill is steep and I was breathing hard! It’s definitely a rude awakening after coming out of the water. 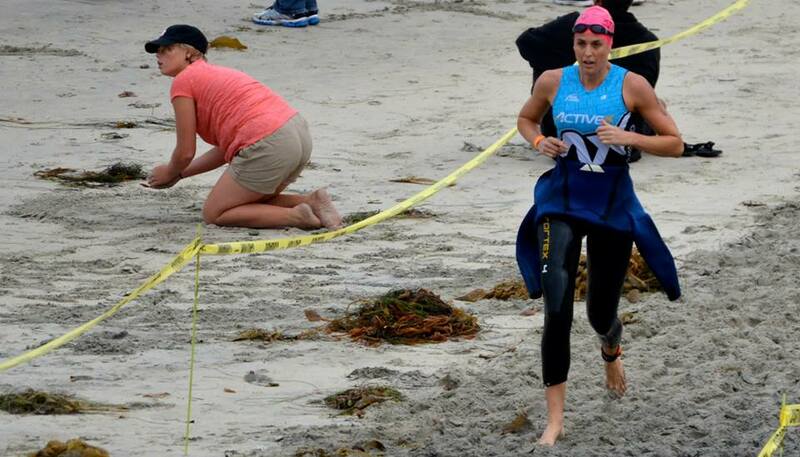 Transition went smoothly other than the fact that I couldn’t get my race belt clipped on and it kept falling off. It was quite a trek out of transition in my bike shoes to the bike mount line. As soon as I started biking I tried to catch my breath and then just focused on riding hard. The course is 9 miles made up of two loops. Both loops have a very tight u-turn at the end of them as well as a u-turn in the middle, for a total of 6 tight u-turns over the course of 9 miles. 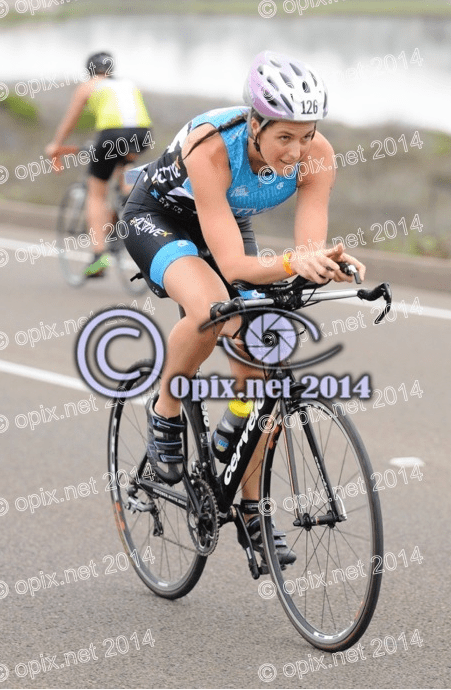 As I came out of transition I was neck and neck immediately with the girl I passed in T1. However, after the first U-turn, she quickly passed me. As soon as I caught up, we hit the next u-turn and she passed me again and I didn’t get close again. I had fun out on the course and looked for Mike, Jeremy, Brooke and all the other friends I knew racing. I got passed by a few more women in my age group but all in all, was actually pleasantly surprised that I didn’t get passed by more! In the end, I found out that I was passed by 5 women in my age group on the bike, as I had the 8th fastest bike split in my age group! I was pretty happy with that! As always, I was excited to get off the bike and run! Most of the time when people passed me on the bike I had told myself I’d catch them on the run. Coming out of transition, I passed one girl in my age group almost immediately. My legs didn’t feel fantastic at first but I started to warm up quickly. It was really fun being out on the course in my ACTIVEx gear. There were so many fellow ACTIVEx racers out there and I had a great time on the first loop (of two) slapping peoples hands, cheering on teammates and smiling as much as possible. Once I hit the second loop, it was time to get to work. I picked up the pace and it was no longer comfortable to talk or cheer others on, although I tried to as much as possible! At times I just put my head down and focused on catching someone in my age group. I hadn’t seen any that appeared to be on the same loop as me but I just focused on keeping the effort up. When I made the first u-turn (of two) on the 2nd loop, I saw the girl in my age group who I’d passed in T1 and who passed me back in T2. She was ahead and moving at a good speed but I knew I was moving faster. I had less than 1 mile to catch her but I made it my mission to do so! As soon as we hit the second U-turn, I figured it was time to make my move, as I assumed she had seen me and would pick up the pace. I caught up to her fairly easily and sat behind her for a few strides before deciding to make the pass with less than 1/4 mile to go. Soon after I saw Jeremy and Mike who had already finished and they cheered me on. I sped up and went all out for the finish line. After I finished I found Brooke, Mike, Jeremy and the rest of the ACTIVEx crew and we cheered our teammates on until nearly everyone had finished. It was so great to see so many of them finish their first triathlon – something that some of them never thought possible before joining ACTIVE. Toward the end of our cheering it suddenly began to rain and San Diego had one of it’s only rainstorms of the entire year! I grabbed my gear pretty quickly and ran to my car as I had to head out almost immediately to make the drive to Huntington Beach for my good friend Jill’s baby shower. If you’ve ever considered Solana Beach for your first or next triathlon, I highly recommend it. It’s an amazing course and spectacular race put on by the always organized Koz Events. And now that Mike has a conflict on his 25 years of the AFC Half Marathon goal, he’s decided that the Solana Beach Triathlon will be his 25 consecutive years race. So we’ll see you next year! Do you have a race that you do every year? Why do you always do it? I do the Shamrock 15k and Blue Lake oly every year. I am not sure why I do Shamrock every year. It is a hard race and a shitshow because so many people run it. It is fun though and everyone I know is out there! The oly is kind of the kick off to tri season. Again everyone I know does it so it is really fun to see everyone out there! SOme races are just fun because of the people and nothing else!! Congrats on the great race! I have a few smaller races like 5k/5milers that I like to do in my area each year. It’s nice to support local races/causes but also nice to be able to see progress from year to year on a personal level. Yes the weather or whatever might be different each year but same course etc. helps create a familiar atmosphere. Thank you! I agree supporting local races is always great! Fantastic race Nicole!! Holy crap under 9 minutes for a 1/2 mile swim?! that’s super fast! You look so strong in all of your photos, love it! Haha thank you! Although that was a typo on the 2nd time I wrote the swim distance – only 1/4 mile! That would be pretty epic if it were 1/2 especially in a beach start ocean swim! Congratulations on a great tri, Nicole!! That’s awesome you finished all three disciplines so speedy! And way to catch those ladies on the run! I want to find an annual race to do now! I think it would be fun to compare year-to-year!